The patches are together and the borders are on! Unfortunately I don't have two other people here to stand on chairs and hold it up to take a pic for you, but here's a sneak peak. It looks great guys – thanks heaps for all your work. Even the lady in the quilt shop, where we were buying the cream border, came over to exclaim at it. She said the colours were so happy they made her smile and she loved the pattern. I think we can all be very proud of our team effort. Doesn't that Blue border just look soo good. Wow - it looks simply beautiful!!! 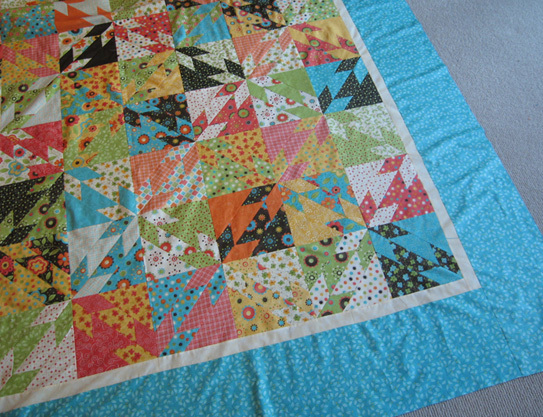 Like the lady in the shop said... it is a happy quilt - hence, I am sure it will bring a smile to Ames and Luc on a daily basis. Well done on designing it and pulling it altogether Tara. You are gifted! Tara, How is it back at work? Bet it's not as enjoyable as this blog and quilt effort that has come about due to your wonderful effort, colour sense, fussiness and lets face it, sheer artistic abilities. I for one will miss our Stitch and Yarn Blog. Thanks everyone for your lovely words. Yes, Sandra you are right, I would much rather be home mucking round with colours and patterns than being at work... one day!